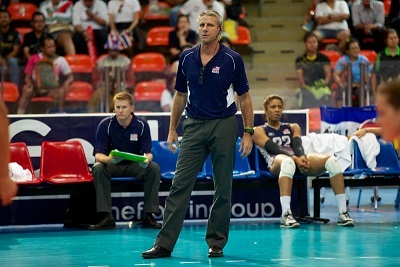 Volleyball quotes from famous volleyball coaches and icons. "I practice to impress the coach. He's the one who decides who plays." "Hey, I'm ready for anything you've got - give it to me". "Be a leader. A setter should be high energy. It's important that you learn how to give positive, constructive criticism. It's crucial that you make your teammates feel comfortable. You should never be the most silent player in the gym." "No! Not at all! My body can't take it any more. Indoor just hurts too much." "He was another coach to us," says Salmon. "You always hear about superstars, but it's the guys who allow the superstars to happen that are really special. In the finals against Brazil, Lloy would go up to Tom and say, "What do you see happening on the other side of the net right now? And any time I would get nervous or Reid would get nervous, Tom would talk to us. Without Tom, I don't think we would have won the gold." "You have to study psychology. A coach is a teacher, the player is his pupil, who apart from physical ability and knowledge of the game has a character which the coach has to get to know." "Sometimes the players argue with one another, sometimes the coach needs to get involved and sometimes he should not. However, it is fundamental to problem solving that he must be fair and he must always work for the good of his pupils." "My husband would tell you that I'm one of the most competitive and intense people you'll ever meet. When I step on the court, I don't want to ever feel like I've wasted time or that somebody else has worked harder. When the coaches asked me to be part of this team, They said: 'We think we can make you a better player.' As a 31-year-old, that's exciting because I'm getting to the back end of my career. Every day I practice, I want to use it as a chance to get better." -- Nancy Metcalf response to the question, "How do you motivate yourself to practice on a day you don't feel like practicing." "Most teams end the season with a loss. Therefore, it is essential to keep the entire club experience in perspective. The chances of a given club producing future Olympian are slim. The chances of producing a college player are significantly better, but still not assured. That said, at the end of the season broaden the scope of your evaluation and look at the friendships that the participants made, both inside and outside the club. Consider the many experiences shared by the players during travel, training, competitions, and beyond. If you feel that the participants learn only to pass, set, attack, or block better, look at the way the athletes and their parents interact during their school season. The real goal of a club is to provide on and off court experience that help the athlete become a better volleyball player and better person."